2009/01 Black Tie Smile wine decanter by Riedel. With its signature Black Tie tuxedo line running from the spout to the base of the decanter, the Black Tie Smile wine decanter makes for a great addition to your collection of mouth-blown crystal wine accessories. 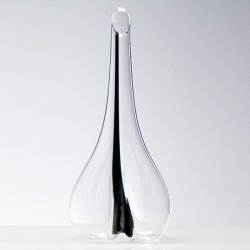 With an inverted heart-shaped base, the decanter is simple to hold and makes for an elegant eye-catching piece.